The reactive mind often leads to behavior that results in a mess. We can take a thought, give it momentum, and before we know it, we’ve taken an action we’ll soon learn to regret. We know it’s of human nature to live in a mind of dis-satisfaction. The next negative emotion is coming up just around the corner. We can’t stop this, however, we can learn to dismiss it. With practice and awareness training, we can catch it, come back to our center, and find our balance. How often have we heard the wisdom of taking a “balanced response”. There are certain disciplines I’ve practiced for decades and I’m gaining greater confidence in my capacity to hold balance. Boardsports, yoga and music are perhaps my main disciplines that have tested me over the years. In music, playing with and for others, I’ll sometimes miss a note. I can attach to my judgment of the performance or I can allow it and move on to meet the next arising moment anew. If I let the critical mind grow momentum to the thought of the missed note and my insufficiency, I greatly increase my likelihood of missing another upcoming not. If I let it go, return to my center in the here and now, things go better. Less mess. Yoga has the same impact. The precision and depth of my postures are directly related to the ability to ‘let go the thought filled mind’. When given momentum to a thought of comparison I greatly increase my chances of injury and falling out of the posture. One of my meditation teachers told me that our life is really just a journey at going deeper into our posture…touching our center in a ‘balanced position’ (the definition of asana in yoga). When in balance we break the illusion of our separateness. We feel supported, never alone, effectively feeling the love of the universe. It’s a feeling of ‘fullness’ vs. the typical feeling of restlessness that moves through us so much of the day. While musical and yoga performance are great disciplines to practice balance and posture, perhaps my lifetime of dedication to boardsports and the elements is the most palpable. We learn skills of our sports (windsurfing, kiteboarding, SUPing, surfing, etc.) on a flat surface. As we gain precision in our skills, we challenge ourselves to more turbulent conditions. These conditions place more demand on our capacity to ‘allow’ things to come up without panicking, without losing our center. Over the years, most of us in boardsports can look back on moments where a reaction taken from out of center would have ended our life. However, with pause and a return to our center, we’ve felt a bigger support. I’ve learned so much from the statement, “When the problem seems big, go bigger than the problem.” These activities capture the need for balance in ‘body/mind/spirit’. There’s a deep respect for the elements and their mystery, for the very nature of ‘surprise’ around every corner. The unborn security that comes from a dedicated practice in our discipline and posture give us the confidence to receive the grace of that which is bigger than us. That was the nature of my day on Lake Superior yesterday. We arrived to what we call ‘lit up conditions’. The strong 30 mph winds had churned the lake into a white frothy picture of endless waves. Conditions had definitely turned up several notches from what we thought we were driving up to. My watersport partner, Judd, and I looked at the conditions and knew it’d be a day for full awareness, a mind of presence. We rigged our small gear and went into some of the most turbulent conditions I’ve ever seen. There were mountains of water moving everywhere and it became the perfect place to practice surrender to the moment. We could accept the conditions in love, beyond our mind’s notion of separation, or we could let fear and resistance break us apart as the tremendous force of Lake Superior worked to destroy us. Things were moving so fast, with no apparent organization. Waves would randomly break on the inside and on the outside. As soon as I left awareness of the moment in fear, I got kicked. As soon as I returned to the breath and the moment, time slowed and the apparent chaos of the water was gone. Exit plans opened as grace was given in full support to what was put before me. With a sand bottom and ten foot wind driven waves, their was no predicting when the wave would break. Yet, with surrender to the moment it was like we were outside of time, coming just to the edge of the break in time. These are the moments where we live in the undivided self. I’m not ‘doing’ the wave. I’m not separated from the wave. I embrace the wave as fully integrated to my awareness of my body. This is the essence of returning to the center during what at first appears to be mayhem. At one point I was surfing the face of an eight foot wave on the outside when air got under my fin and the board spun sideways. These waves are moving so fast when the winds are this strong, the thought captured me and I was swallowed, turned and churned underwater, and I clearly remember the ‘feeling’ of support as I hung on to my equipment through the ordeal. The response of gratitude for the support fed my strength to quickly get back up and ride another wave. I was the water, the wave, the moment. It was time to dismiss fear and judgment of myself or my equipment or the conditions. The chaos of the water had no time for another thought. I’m not such a young man anymore. The youth that could take thrashings like this was gone. Yet, the wisdom of hundreds of hours on the water and in balance training left me having more water time in these demanding conditions than ever before. My sessions we generally only 20-30 minutes before I’d have to come in a recuperate. Judd stayed out the entire time and illustrated silent confidence on the water with the exception for a few moments that stole his peace. After each break the power of intention and grace had me face the breaking waves with a sense of freedom and gratitude. So few will ever get to experience the beauty of such radical water terrain. My last run out felt perfect. The wind was strong as I easily hopped over wave after wave to deeper water. I’m not sure what happened on that last wave, but it swallowed me up and spit my equipment away in a split second. I was in cold water, equipment gone, in strong rip currents, exhausted from several hours on the water. The negative thoughts and fear still rose up. However, practice gave me the courage and strength to surrender to the moment in gratitude for the fullness of the day. In peace, I rolled over on my back, gave the weight of my body to the water, looked up at the beautiful sky, and prepared for the next wave to wash over me. With the strong rip current, I needed each wave to assist me in getting to shore. Each wave was like a breath in. White water approaching, hold the breath, paddle and kick like crazy, and then relax in gratitude once it had passed. I was supported. I was not alone. Grace was all around me. Wave after wave washed over me and I allowed the moment to be, in surprise to the next arising moment. 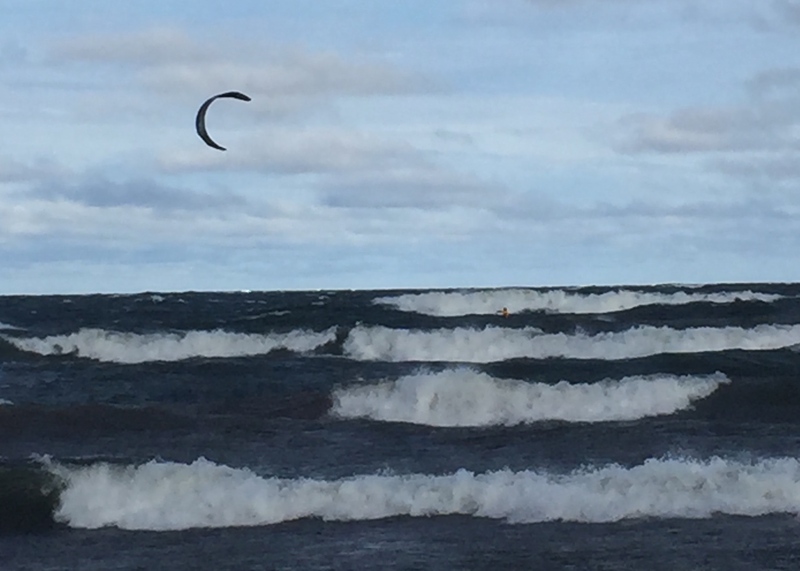 To my surprise, I had been carried to shore, could humbly touch earth, and concluded my sailing session October 20, 2015, on the mother of all lakes, Lake Superior. These waters are sacred. Judd and I were now lit, sharing our observations and insights of the day as we came to the absolute feeling of fullness, the absence of complaint and restlessness, in honor to the sacredness of all things, places, and beings. We found our peace in the midst of mayhem and we were filled with joy. Please leave your comment so we know what you think about this article. Trackback URL: Holding Your Center in Mayhem.